"Speak Up" has burst onto the Charlotte media scene with handsome graphics printed on heavy paper, an easy-to-read layout, appealing articles -- about religion, music, little-known local resources, immigration -- and a scan code for more online content. Its goal, says the contents page, is to create jobs and give hope. And it's about...the needy. I've seen folks hand out weekly newspapers on street corners in New York and Toronto, earning money for themselves by selling similar (and flimsier) publications. This is the first time I've seen a magazine-quality publication tackle similar issues. I read its 32 pages literally from cover to cover. The cover shot, a picture of a woman climbing avidly down into a dumpster, caught my eye. In that article, "Dumpster Diving for Awareness (and dinner)," writer Kaitlyn Tokay explained why she has spent the last year -- by choice -- gathering and eating the majority of her food from among the things stores throw away. I was hooked. The topic made me wonder if the stories would be downbeat, sanctimonious or asking for donations. They weren't. 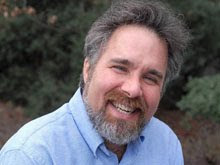 I learned about artist David Alan Goldberg and musician Denison Witmer, Buskapalooza organizer April Denee, a soccer World Cup for homeless players and urban pioneers who started the Free Store in Charlotte with the motto "Give what you want, take what you need." All the articles were connected to life on the street or among the poor in some matter-of-fact way, but they were diverse and never maudlin. (Go to speakupmag.org/issue1 to see what I'm talking about.) They reminded me that, even in a crowded and diverse media market like this one, there's always room for a smart niche publication. Thank you for sharing your thoughts on Speak Up magazine, it is very encouraging to hear your good review. We have been at this for some time now. On the verge of publishing the next issue, which we hope will be an even better product for our vendors to sell. I love Speak Up, so much so that I shared my copy with friend in California as soon as I read it two or three times through. I couldn't just keep it to myself! Like you, I felt it presented a voice and vision that needed to be shared. Can't wait for the second issue!!! 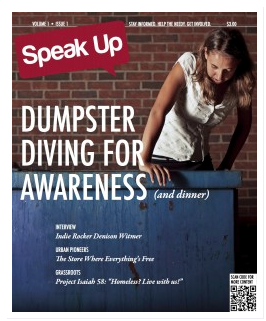 Thank you for sharing your great commentary on Speak Up magazine. It truly is top notch and well done. Each article has captured my attention and moved me to want to be more active in our local community here in Charlotte.